Ok, I read the ingredient list. Just not that well, apparently. 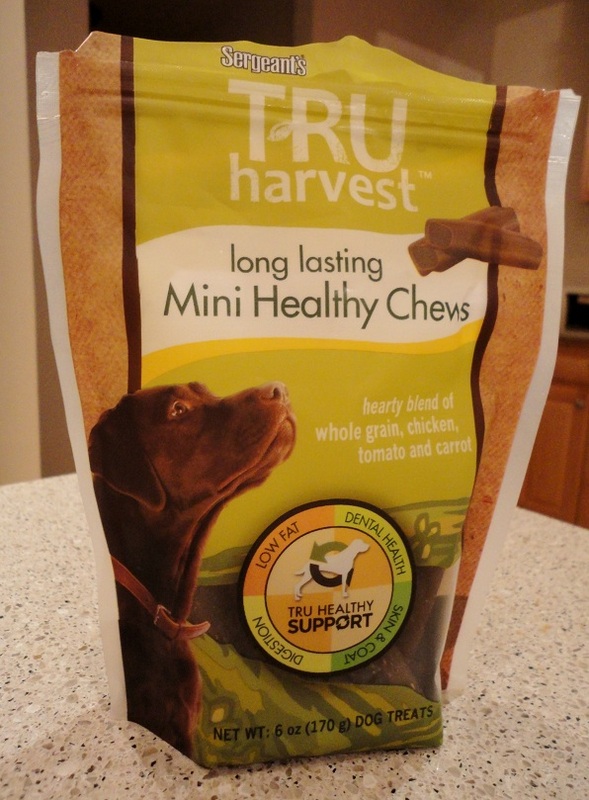 These are Sergeant’s Tru Harvest Mini Healthy Chews. Never heard of ’em? Neither had I. And now I know why. I’ll be the first to admit that I’m a total treat snob. Me? 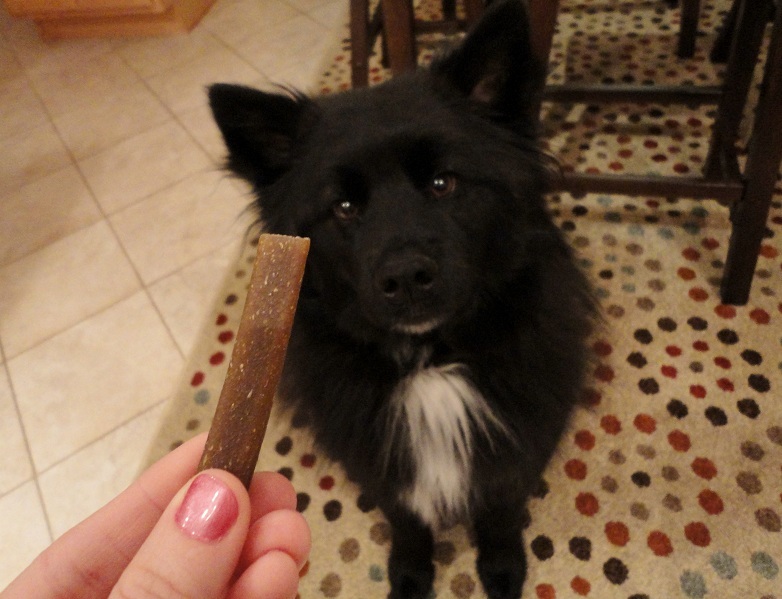 Buy treats for Teton at Wal-Mart or Fred Meyer? Never! I don’t mean any disrespect if that’s where you buy your dog’s treats, but I’d encourage you to do some research on what’s inside most treats sold at grocery stores and places like Target or Wal-Mart. It’s (usually) not pretty. This purchase, my friends, is the result of an impulse buy at a grocery store. I know, I know, I can’t believe I did it either. I was in a mad rush to grab a few items to fill Teton’s stocking and, well, this is all that looked legit at Freddie’s so after a quick glance at the ingredients and an approval of the price tag ($5) I tossed these treats in my shopping cart. Without reading the ingredients in detail, these treats seem pretty harmless. 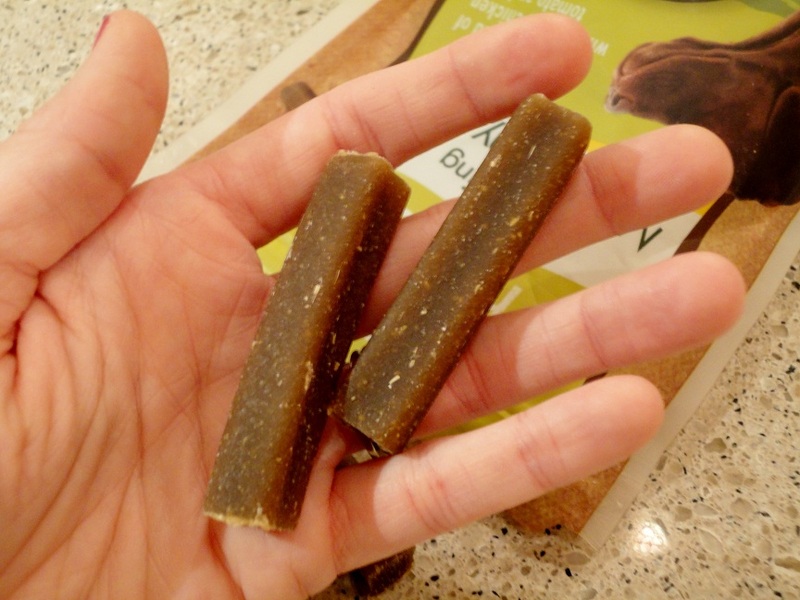 Claiming to be a “hearty blend of whole grain, chicken, tomato and carrot,” these chews are on the small side and are pretty dense. 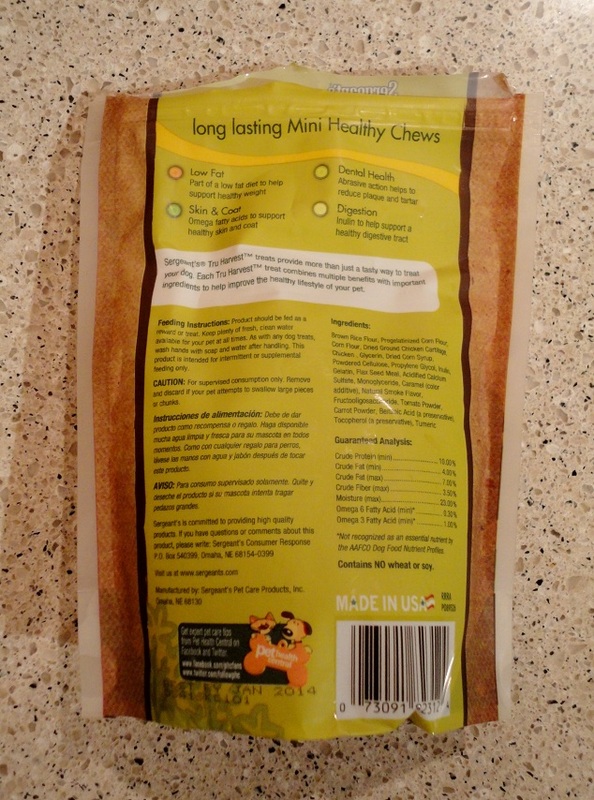 Feeding instructions aren’t very clear (as they usually are with most dental chews), as the bag reads “Product should be fed as a reward or treat.” The general rule of thumb with dental chews that I’ve always heard is one per day, based on your dog’s weight and the size of the chew, of course. The Little Blogger took his time with this chew and broke it up pretty well before ingesting it, which I was pleased with. For the record, he has turned dental chews away in the past and he readily ate this (he’s had roughly three since Christmas) so it’s obviously appealing to him. But, back to those ingredients. 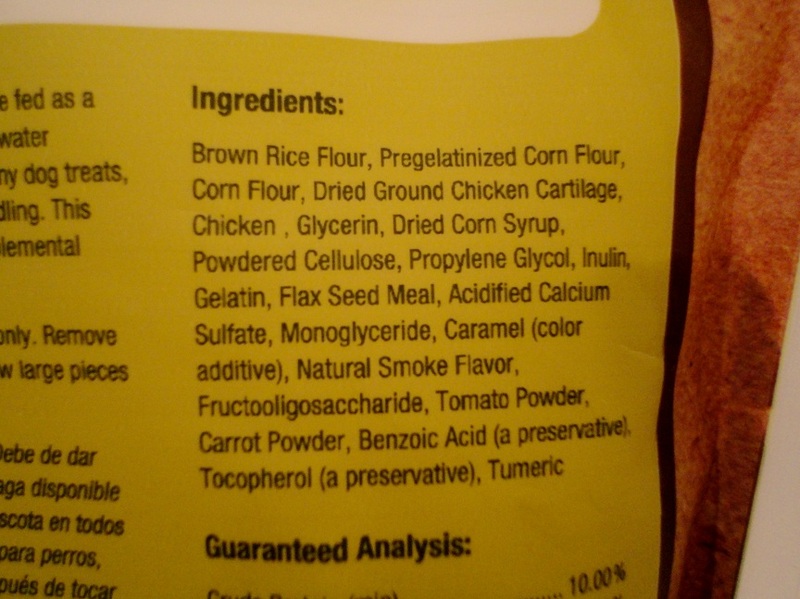 I’m not thrilled about most of the ingredients in these chews, but two stand out as being particularly disturbing. First, dried ground chicken cartilage. Ew. I get that it’s supposedly a source of glucosamine and chondriotin, but no thanks. I’m not a fan of giving Teton cartilage. Period. The other ingredient that really bothers me is gelatin. Do you know what gelatin is? Gelatin is derived from collagen and it’s made by – are you ready for this? – boiling the bone and skin of animals. It’s pretty scary how many things contain gelatin. Before you reach for a marshmallow or piece of licorice, read the ingredients on the package! Gah. If I’m not going to eat something with gelatin in it, neither is Teton. So, there you have it. My rant for the week. It wasn’t so bad, was it? 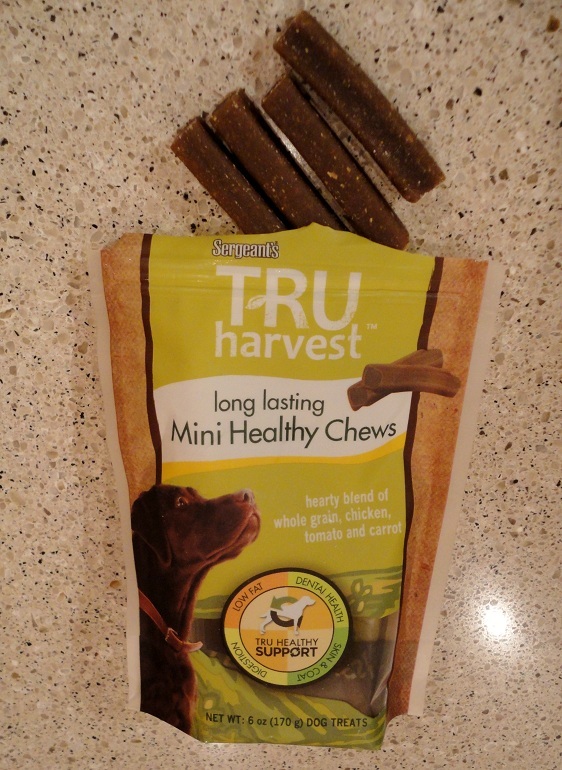 Bottom line on these Sergeant’s Tru Harvest Mini Healthy Chews is that they aren’t the worst thing out there, but they certainly aren’t something I’ll be buying again. 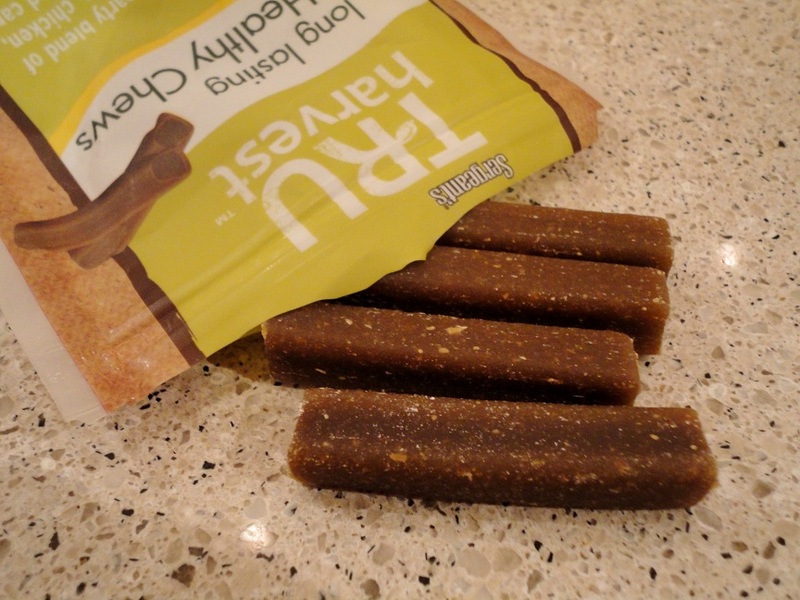 There are plenty of other treats out there that are packed with hearty, all-natural ingredients that your dog (and you) will love. 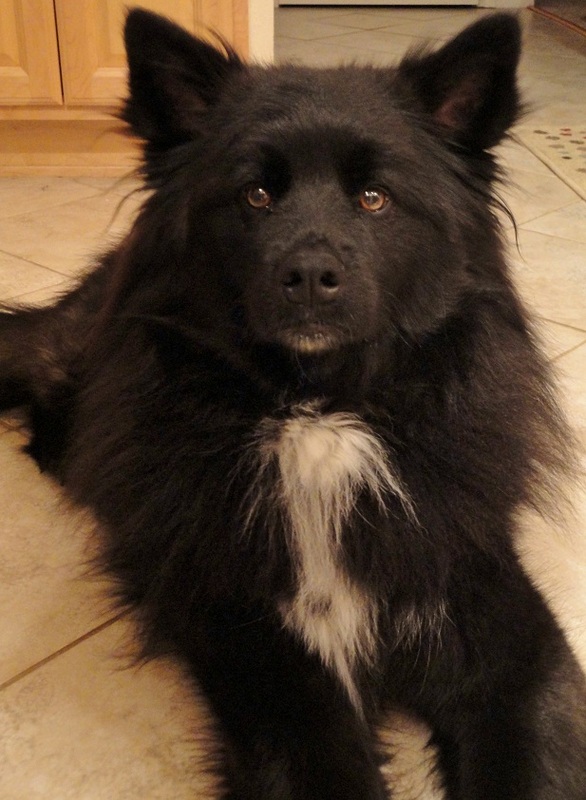 Posted on December 29, 2011 December 29, 2011 by Shannon	This entry was posted in Treat Jar. Bookmark the permalink.